TACFIT Sports presents the all new TACFIT Rugby. This revolutionary training manual will absolutely transform the way you train for Rugby. The easy-to-use format explains the essential components of TACFIT Rugby training, including considerations for positional players. The exercises in this program have been reversely engineered ensuring that Rugby athletes maximize their benefits from their training. The 100+ page manual includes detailed descriptions for dozens of these unique exercises, with key training cues. By grouping the exercises in related progressions, the manual allows the coach to quickly customize the workouts to meet individual athletes’ needs. This means everyone can work out together and reap effective results. Score sheets are provided for each of the workout protocols, so you can track and compare performance over time. The programs are delivered in electronic PDF format, for convenience and portability. The score sheets and calendars can be printed out for use in the field. Simply put, this is the easiest and most effective Rugby training program available. 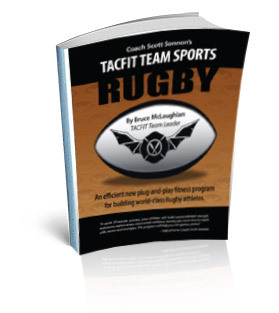 The TACFIT Rugby manual gives coaches and players a blueprint toward achieving elite Rugby performance.